If for any cause you should be called home, kindly drop me a card as soon as convenient. In that event I may purchase round trip ticket to North field and it must be ordered in advance. The hot [indecipherable] is broken and this morning it is some what cooler. Will write you soon. Lovingly - M. July 27, '10. As a final note, this postcard was made in Germany and sold by F.W. Woolworth & Co. of York. That company had some important ties to Lancaster, York and Harrisburg here in southcentral Pennsylvania during its early years. I am not 100% sure but I think this rock formation is along the Codorus Creek. It is on the south side of the creek about a mile beyond the North Sherman bridge that crosses the Codorus just beyond the Springettsbury Township Sewage Treatment Plant. 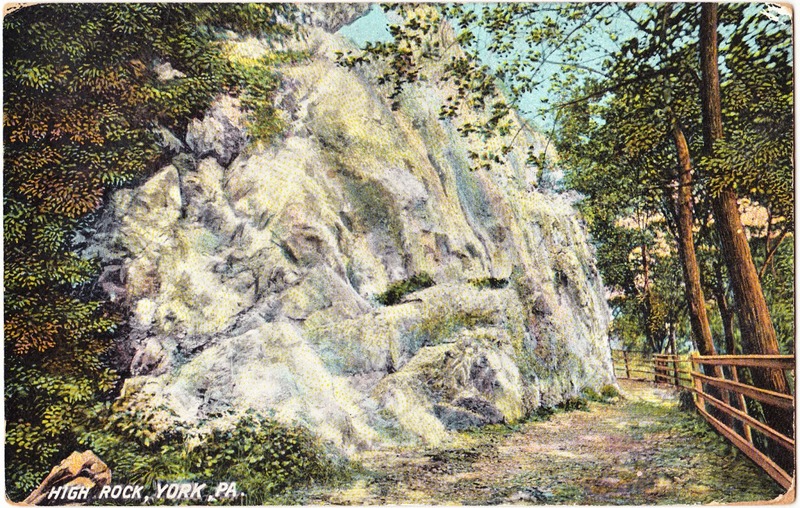 This rock formation is along the remains of the old Codorus Canal. You used to be able to get to it through a path off of Old Toad Road close to the legendary Mad doctor's House or "Gates of Hell" My brother-in-law grew up in that area and his grandfather operated a sawmill along the Codorus Creek not far from this rock formation. The sawmill was located about 3/4ths to a mile beyond the Sherman Street bridge. When my brother-in-law saw my exact postcard, he immediately recognized it, he told me about the stone and walkway and how he often walked there. Perhaps "high rock" is descriptive, and not an actual name of the outcropping.